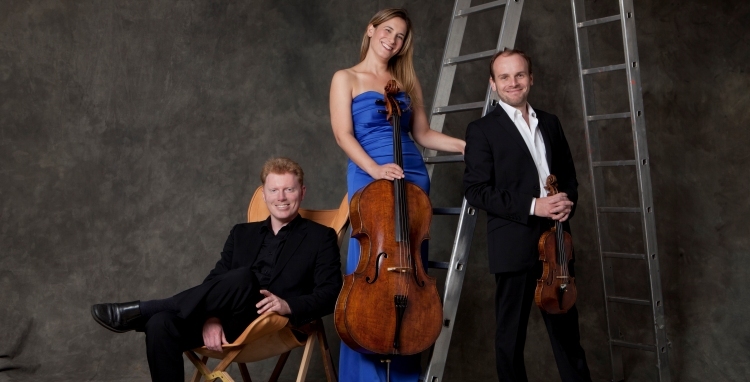 The Leonore Piano Trio brings together three internationally acclaimed artists, Benjamin Nabarro, Gemma Rosefield and Tim Horton. Originally under the umbrella of Ensemble 360, their trio performances were met with such an enthusiastic response that they decided to form a piano trio in their own right. Known for their ‘knuckle-whitening abandon and panache’, these popular artists always lay their virtuosity entirely at the service of the music. Between one of Haydn’s last trios, written in London in the 1790s and Beethoven’s last trio, the ‘Archduke’, of 1811, the novelty of the Leonore’s programme is Hubert Parry’s first trio. Written in 1878 when the young Parry had just abandoned the insurance industry for the life of a professional musician, the trio is brimming with attractive melodies and culminates in an energetic rondo. 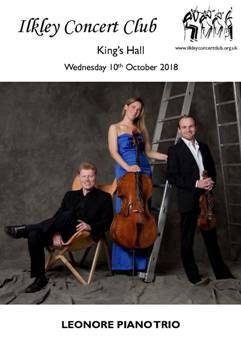 A packed King’s Hall greeted the Leonore Piano Trio for the first concert of the 73rd season of the Ilkley Concert Club. These players are well known to Ilkley music-lovers as part of the Sheffield-based Ensemble 360 but have been playing and recording as an independent trio since 2012. Their programme started with one of Haydn’s late trios, written in London and designed to show off the excellence of Broadwood’s new pianos. The strings necessarily take a subsidiary role but we were at once aware that these players know each other inside out so that balance is never a problem. Tim Horton managed the intricate piano lines with his usual lightness of touch with Benjamin Nabarro (violin) and Gemma Rosefield (cello) giving strong support, especially in the stormier passages of the third movement, which they took at a cracking pace. The discovery of the evening was Parry’s first trio, an unexpectedly substantial work. Although there are echoes of Brahms throughout, the scherzo had a Mendelssohnian lightness of touch, bubbling along towards a carefree ending. The following adagio is the romantic heart of the work, a duet in which the violin and cello trade lyrical phrases against a rocking piano accompaniment. The Leonore gave the work a committed performance which evoked warm applause. Reserving the best for last, the players excelled in a magnificent rendition of Beethoven’s Archduke trio. Every line was given its due weight without detracting from the ensemble with some fine passages especially from Gemma Rosefield’s cello. The staccato section in the first movement was faultless and I was particularly struck by the sinister sound of the sinuous worm-like second subject in the second movement. There was rapt attention in the hall for the hymn-like variations of the third movement before the trio culminated in a vivacious account of the finale with its typically Beethovenian surprise ending. A well-deserved and extended ovation greeted the trio to which they responded by playing the adagio of Beethoven’s Op. 11 trio, written for clarinet, but here given in its violin version. Two very fine performances at medium price are easily recommendable. The Kungsbacka Piano Trio are beautifully recorded on Naxos 8.572062. The disc is completed by 3 more Haydn Trios. The Trio Wanderer on Harmonia Mundi HMG 501968 are equally recommendable, and the CD is again completed with 3 more Haydn Trios. There appear to be no commercial recordings currently in the catalogue. However, a deleted Meridian CD coupled with Parry’s Piano Quartet, performed by the Deakin Piano Trio, can be found on the internet at inflated prices. It will be worth waiting for a recording by today’s players of both of Parry’s Trios being released by Hyperion in early 2019. For those who prefer performances on period instruments, Harmonia Mundi HMC 902125 provides a superb performance by Isabelle Faust (violin), Jean-Guthen Queras (cello) and Alexander Melnikov (fortepiano), coupled with Beethoven’s Piano Trio No.6. On modern instruments the Kempf Trio are superbly recorded, with Piano Trio No.3, on Bis BIS SACD 1172. At a more moderate price, the always reliable Beaux Arts Trio still sound very well on Decca 478 5153. The couplings are piano Trio No.5 and the Gassenhauer Trio for Clarinet, Cello & Piano.